Frequently grocery stores will put quality items on their end-caps with a sale price to entice shoppers to make impulsive buys. Grocery stores also put items that aren't selling well on end-caps with a sale price, just to clear the merchandise. Nerd the Focus and Energy Beverage was on an end-cap and greeted me with a sign that read "Special." Assuming that referred to the price, I picked up a four pack and moved toward the check-out stand. Wondering why this product would be on an end cap, I casually glanced at the cardboard package holding my four cans in one place. A thick layer of dust coated the top, which gave me the vital context clue I needed. Now with a chilled version of the aforementioned product in hand, I scan the label to see what is about to be in my belly. 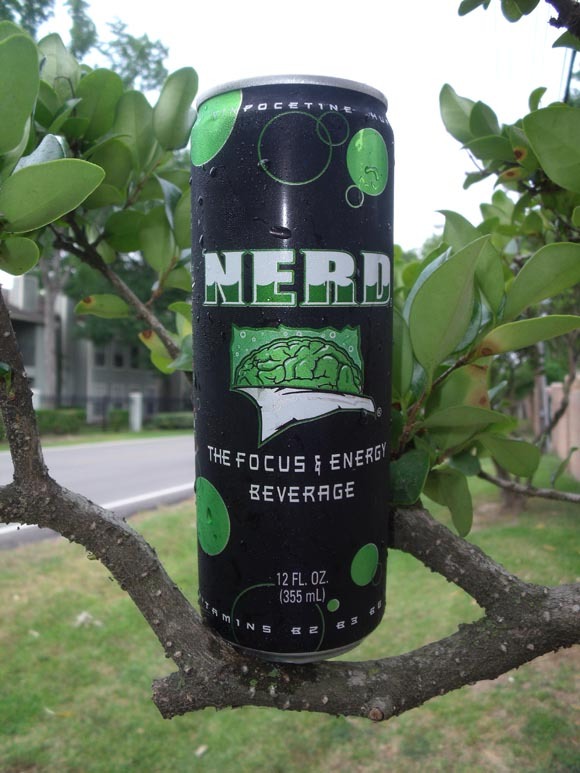 First, NERD alerts me that it is "The focus and energy beverage." I find it strange that this product is called an energy beverage and not a drink. Second, this focus and energy beverage has many ingredients listed, none of which I can pronounce. Third, this beverage is made in San Antonio, TX. That fact is cool, but I was born in Texas, so I might be biased. I crack open the top. Lemon-Lime is the best way I can describe the smell. It's not bad really, and I've smelled worse. So the plunge is taken and a huge gulp it forced down the old drain pipe. Lemon-lime flavor that borders on the grotesque figuratively hits me between the eyes. I take another sip; the same lemon-lime taste smacks me in the mouth like mommy dearest in rare form. I have no desire to finish drinking what remains, so this review is over. I will now focus on other things, good bye NERD. Final review: Buyer Beware: Folks if you just want to try this, go ahead and do it don't say I didn't warn you though!